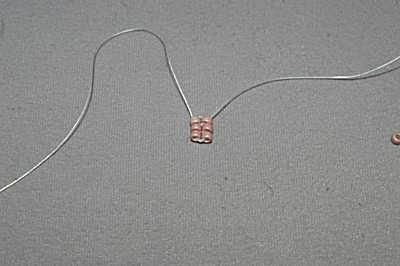 To get started, on a comfortable length of beading thread (no longer than 5 feet), string a stop bead. Pick up 3 seed beads. Work in square stitch to add a second row. As you work each two rows, make sure that you go back and reinforce them by stitching back through the row next to the one you just completed. Then pass the needle and thread back up through the row that you just completed. Once you have finished stitching the strip of square stitch, fold the strip so that it forms a loop at the top with two tails or ends on the bottom. You can adjust it a bit with your fingers until you get a shaped loop that is pleasing to you. Once you know where you want your ribbon to be tacked together, stitch back up through the ribbon. We stitched back 8 rows. Make sure your needle is exiting from the middle seed bead of the row. Pass your needle through the back of the middle bead in the corresponding row on the other side of the ribbon. Stitch back through the bead that you exited at the beginning of this step. You should be able to make two or three passes with your needle and thread to make sure that the attachment is secure. Pull snugly so that the two ends lie directly on top of each other. After you have stitched the beads together a few times, continue through to the bead on the edge of the row. Take your needle and thread through the corresponding row on the other side of the beaded ribbon, then back into the row that you were exiting at the beginning of this step. Stitch back and forth through the rows a few times to provide extra strength for the connection between the two sides. Once you have secured the two ends together, weave in your thread tails, tie a few knots in between beads, weave in a bit more, and trim your thread close to the beadwork. You can add a drop of glue on the knots if you wish. After you have woven in your thread tails, you can use a strong glue such as E6000 to attach a pin back to the flat side of the ribbon. The ribbon can be made in any color you choose to represent the cause of your choice.